Curb appeal plays a definitive part in capturing not only the eye but the heart of a prospective home buyer especially when they've got their eyes locked on a mortgage calculator and scrutinizing what makes your home "valuable". When it's the right time to sell your home, never underestimate the importance of a neatly landscaped exterior. According to the president of the Appraisal Institute, "If a landscaping change is positive, it can often enhance price and reduce a home's time on the market." Landscaping includes several elements, from the lawn to the trees, flower beds, shrubs, container plants, and water features. It also can include pathways, decks, patios, and outdoor lighting. When you're selling home, the landscaping cannot be overlooked. A long, scraggly-looking lawn does nothing for a home's curb appeal. Overgrown grass presents the overall feeling of neglect, and that's the last emotion you want prospective homebuyers to experience at a showing. The first and simplest way to improve your place's buyer appeal is to make sure the lawn is mowed and all the trimming has been completed. Note: If it's autumn, keep the lawn raked. If buyers see a lawn full of leaves, they'll be thinking of all the time they'll have&nbsp;to spend raking. Dead or wilting plants should be removed. When getting ready for that first home showing, it's the perfect time to remove any plants you wish to transplant into beds at your new home. 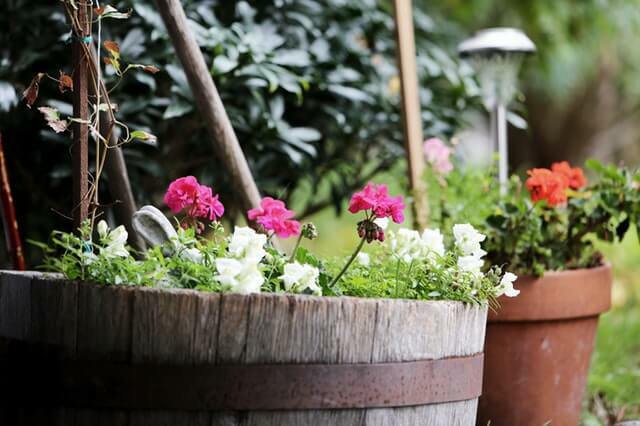 Home sellers should remove plants they want to keep before prospective buyers see the home. If you plan to remove anything after, the home seller needs to inform the buyer which plants may be removed. Clear the beds of all weeds. Add fresh plants and/or flowers to revive any bed that looks drab and neglected. Messy mulch doesn't make a good impression on home buyers. Make sure all mulch is neatly in place and replace any old, discolored mulch with new. If you have rock, it also may need a bit of attention. Rake it neatly and be sure no straggler rocks are about in the grassy areas of the landscape. Replacing your existing mulch with rock may not offer a high enough ROI (return-on-investment) when selling the home. Be sure to carefully calculate the expense, labor, and how much it may add to the value of the home upon selling. Also make sure your pet waste isn't turning spots yellow, hire a pet waste management team if you can't keep up! Removing dead wood from trees, bushes, and shrubs is another good start to improving the overall look of the landscape. You can sign up for a recurring tree service that will trim back any branches that obscure views from the home or detract from the exterior's beauty. Same goes for shrubs and bushes. Water features capture the attention of homebuyers as they tour your property. Fountains, ponds, and other water features should be free from algae and any odors. If you have a fountain or waterfall that doesn't work, consider having it repaired and fully operational before the first showing. A good power washing of the home's walkways, paths, and other concrete surfaces can make the exterior quickly look fresh and new. Power washing removes moss and mold from concrete plus dirt from between joints. It's like giving your home an instant facelift. Don't forget to do the stairs and consider giving the driveway a cleaning as well, especially if it's been stained by birds and berries. Use caution and a gentler setting with washing any painted surface, as the force of the water can remove the paint. With a little bit of work you can revamp your home's landscaping and have it ready to impress prospective homebuyers. A clean and well maintained landscape has the potential to add value to the overall property and help with anxiety by decreasing the time that it's on the market.